Secrets of a Guinea Pig Whisperer Turned Author: Find your Niche. Teddy and Pip are awesome. These most endearing guinea pigs keep you laughing throughout their whimsical adventures. 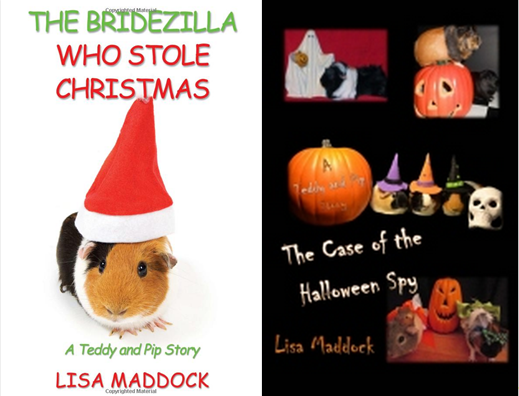 When the Christmas tale came out, I started up a conversation with Lisa Maddock, begging her for a Halloween story for Teddy and Pip. In this house, we are nuts about two things: guinea pigs and Halloween—So what could be better than that? A blog, perhaps? Lisa is a successful indie author, so I invited her to share the secrets of her success. You don’t grow out of Teddy and Pip; they are for everyone! Wheek wheek! (Books 1, 3, & 4) Available on Amazon. Hello! My name is Lisa Maddock. I am the author of A Tale of Two Guinea Pigs, and this is my writing story. In my late 20s, I wrote a novel, and I thought it was great. I loved my characters and my story, loved the plot twists and the romance. I was confident and ready for fame. So I researched publishing companies and wrote query letters, agonizing over every word. I actually sent that 400-page manuscript off to a few publishers who did not require a query letter. It was so exciting! And I got rejected and rejected and rejected. So I hung up my typewriter, metaphorically speaking. I still had that urge to write something, to see my name on a book. I started up the process again: re-researching the publishing industry, looking for tips and ideas. I had a great new story idea now (inspired by Maggie and Peanut, the family guinea pigs). But in more than a few places, I read that talking animal stories were old hat, not the “in” thing. Don’t write about that. The thing to write about now was something that was not my thing. Not my experience. Not me. Meanwhile, my daughter had entered the “chapter books” phase of life. Reading together every night was “our thing.” How wonderful that she always begged for just “one more chapter.” She had a fondness for animals, so animal stories were her favorite. We read everything. It soon became a necessary quest to find more material, especially stories about guinea pigs. There weren’t many. I could write a story about guinea pigs. I knew I could. Maggie and Peanut gave me plenty of material every day, and I could imagine what was going on in their fuzzy little heads. I could make it funny and cute and…. But publishers didn’t want animal stories. Nobody would even look at my story. Nobody would publish it. It wouldn’t matter how good it was, how funny it was. I was unknown. I couldn’t get an agent as an unknown. I couldn’t get known without an agent. Teddy & PIp’s holiday adventures put the Merry in Christmas and the Happy in Halloween. (Books 2 & 5) Available on Amazon. I decided to write the story anyway. I wrote it, not for the “market,” not for an agent or a publisher, but for Allison. My goal: to have a copy of my book in the elementary school library. And wouldn’t it be cool if some of her friends read it too and thought it was funny? 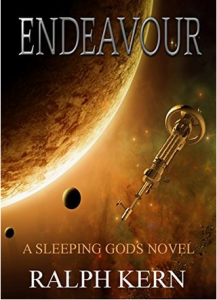 When the story was done, I began research on self-publishing. And I admit that it felt like a sellout, or like it wasn’t really “getting published.” I was not going to get a call from my editor, arguing with me about words. I was going to be the editor. I was going to design the cover and do the back cover text and everything. Gulp. My husband thought it was a nice hobby and a neat-o thing for me to end up with that book to show off to family and friends. I wished it was going to be more than that, but alas. The day the book was in my hands, I went right to the school library. Sandy, the librarian, gave me a hug and congratulated me. She also agreed to write the lovely review that you can still see on Amazon. I was invited to talk to the fifth-graders in the coming weeks about the book. I sold some copies off of my Web site to family and friends, then I ordered another box of books for just in case. It was so exciting! In the meantime, I started up book two (Bridezilla) as a Christmas present for Allison. The characters had become real to me and had more to say. They wanted their story to continue. A local book club found me. They had read A Tale of Two Guinea Pigs and honored me as a guest at their meeting. Wow. With that “celebrity” evening, I had honestly surpassed my goals. But that was not the end of the story. What I hadn’t counted on was how the book caught on. Not from anything I did—because I didn’t do much—but through the internet and its massive reach. The secret of my success? The guinea pig people found me (a.k.a. I found a niche). No, Teddy and Pip have not exactly become an industry. There isn’t a movie in the making, no publisher has come forth and offered to take me on, and I don’t make enough money to quit my day job (though I do make money now, so we’re going in the right direction). I have found more success than I dared to hope for, and I am grateful. I get letters from kids who are reading my book as a class. I answer questions about how I deal with paparazzi (yes, they ask about that for real! Tee hee!) and if I would consider writing about different animals—like a komodo dragon, for example. 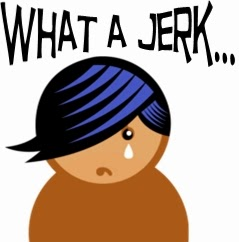 I have requests from kids (and grown-ups, too) to join the Best Friends Club on my Web site. Kids love Teddy and Pip! They quote Pip back at me in their notes and letters. When my sales go noticeably up during December, I get to picture kids opening my book on Christmas morning. I love it all! What a blessing. Best of times! 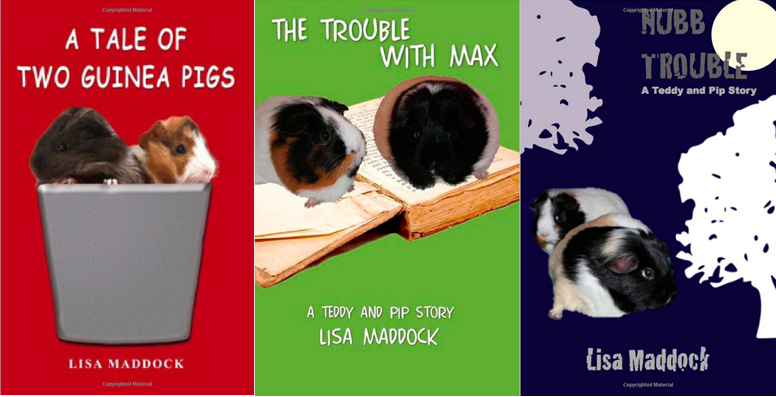 There are now five Teddy and Pip books. My daughter, now 17, continues to be my biggest fan. She has grown into a self-professed grammar freak (lucky me!) and also has become my story consultant, copy editor, and all-things-technology assistant (including webmaster and cover designer). Something is going on in the background of Lucy’s Minnesota life—something that is making it all come apart piece by piece no matter how many times she hits Ctrl-Alt-Delete. Grab a tissue, dive in, and buckle up for the roller-coaster ride that awaits you in Silver Linings. 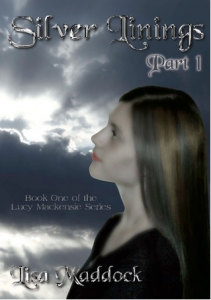 Finally (lest anyone think I am only wall-to-wall guinea pigs), I have also been working for a long time on a YA (young adult) series starring sixteen-year-old Lucy Mackensie, which I have titled Silver Linings. 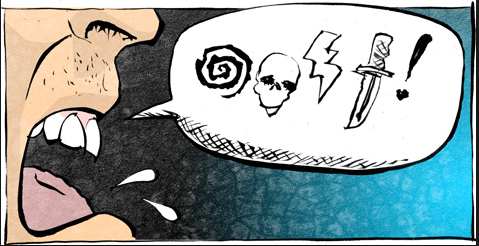 My goal in writing this story was to offer something different from what I perceive as lots of dark and gloomy apocalyptic story options for girls twelve and up. There is a lot going on in the story, and I don’t want to give anything away—which makes it tough to do promotional stuff or to find a niche! I’ll say that it’s a story about people—relationships, friendships, a first love, and beyond. It is my hope that the ending will surprise, the middle will intrigue and provoke thoughts, and the beginning will draw you in, make you love the characters, and want to keep turning pages. It is my hope that the guinea pig people might follow me into that series, once they feel ready for something a bit more. I did sneak a couple guinea pigs into the story in a cameo appearance. I am revising and then re-releasing book one (hopefully) this summer.